Does doing your nightly skincare routine relax you? Yup, same. If you love anything that has to do with skincare, this one's for you! You have more than one variant of your cleansers, moisturizers, face masks, etc. Thanks to our weird weather changes, it's only normal that you need both hydrating and mattifying variants of each product, right? You're always itching to try the latest product release. Anything new is a must-try. But, ofc, before you purchase it, you do your research and "try before you buy!" You rarely let your S.O. touch your face. Their hands are probably filled with different germs that could give you acne. Bae, you're sweet, but we'll pass! And if you do, you ask if they have washed their hands. No offense, honey, but we just want to make sure your hands are germ-free! You always recommend products your friends and family should try. You know the crème de la crème because you've tried at least everything. You can tell what their skin type is just by looking at them. Greasy T-zone and matte cheeks? You have combo skin, girl! You gasp when someone says they don't wear sunscreen every day. Aren't you worried about getting premature wrinkles? Packing your skincare routine for a trip is a loooong process. First, you have to pick which products to actually bring. Then you have to bring out your stash of travel bottles. 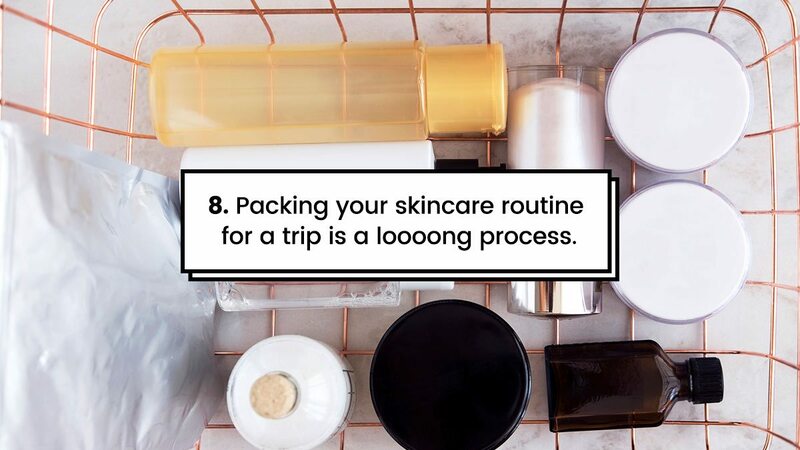 Next, you have to put each product in a travel-friendly container, seal them all in to make sure nothing spills, and then separate your "travel skincare kit" from your "airplane skincare kit." So easy! Doing your routine relaxes you. Some people relax by doing chores, so what's wrong if cleansing and moisturizing your face make you feel ~*zen*~? You know that expensive products don't always mean high quality. You know that some P2,000 face masks are just as good as the ones that cost P100. A product's packaging can convince you to buy it. We're looking at you, Glossier! LOL. No matter how drunk you are, you always remove your makeup before sleeping. The least you could do is let your pores breathe! But if you still forget to remove your makeup, click here to see how you can save your skin the next morning. You know which ingredients to watch out for in your products. Parabens, mineral oil, formaldehyde, lead, talc, the list goes on. You have a ton of backup products. You're afraid of running out of your holy grail serum, so you buy five extra bottles. Admit it, you tell yourself this to justify all your pricey purchases.